Last week I was down in Invercargill and had the opportunity to visit one of the Blue River Dairy Farms. While most kiwi farmers grow sheep only for their woolly coats and meat here they have embraced the ancient Mediterranean farming practice of sheep milking. But this is not about shepherds tending small flocks and hand milking them. The Blue River Dairy team have embraced modern technologies. I watched as large flock of sheep was efficiently herded into their state of the art milking shed, Above each sheep a small LED screen showed and recorded exactly how much milk it produced. 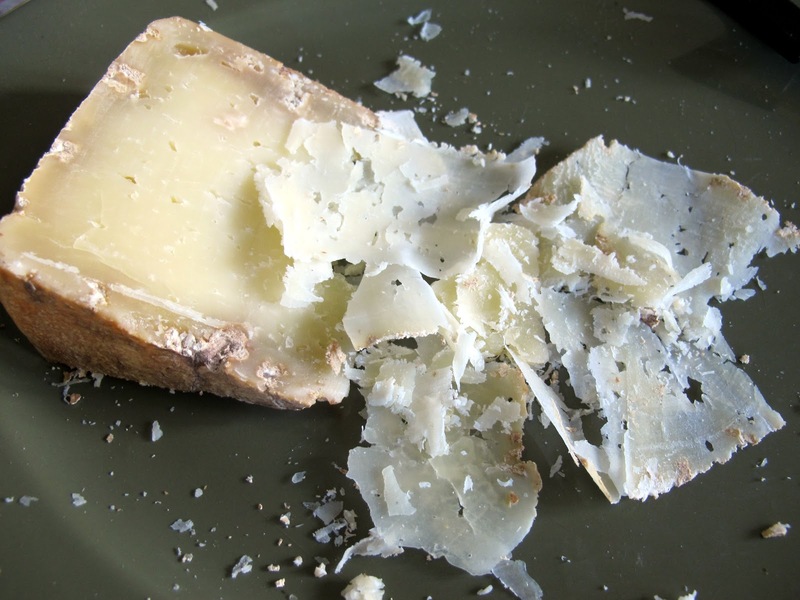 The sheep milk is made into various cheeses : Tussock Creek and Vintage style Feta, Monowai Halloumi, Curio Bay Pecorino, and Blackmount Aged Cheddar. I took home some of their Curio Bay Pecorino, a hard cheese which was a 2010 Silver Medal winner in Cheesefest.Once made this cheese is left to mature for 5-7 months. Underneath its natural rind it is the colour of yellow straw and has a very distinctive taste. 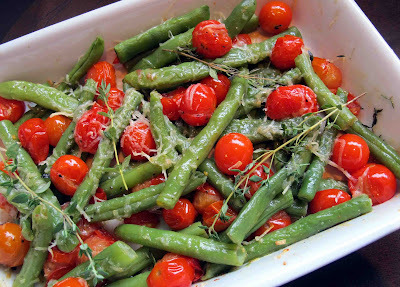 Back home there was a plentiful supply of cherry tomatoes waiting to be picked and our neighbours kindly dropped off some of their surplus greenbeans . With the addition of a splash of olive oil, some sprigs of fresh thyme and some grated Curio Bay Pecorino cheese these were soon transformed into a colourful and tasty vegetable dish. 2. Toss the cherry tomatoes and sliced garlic in a couple of tablespoons of olive oil. 5. Scatter some sprigs of thyme over the top. 6. Roast in the oven for 20 minutes. 7. In the meantime bring salted water to the boil. 8. Top and tail the beans. 9. Boil the green beans for 6 minutes. 10. Stir them through the cherry tomatoes. 11. Sprinkle with 3 tablespoons of grated Curio Bay Pecorino cheese. 12. Bake for another 10 minutes until the cheese is crusty and golden. The worst of the winter appears to be over but in the evenings especially it's still soup weather so I set to and created this recipe. 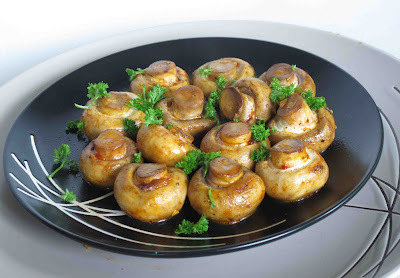 It is comforting and nourishing and makes good use of vegetables which are in season. Its vivid orange colour will brighten up any winter's day. 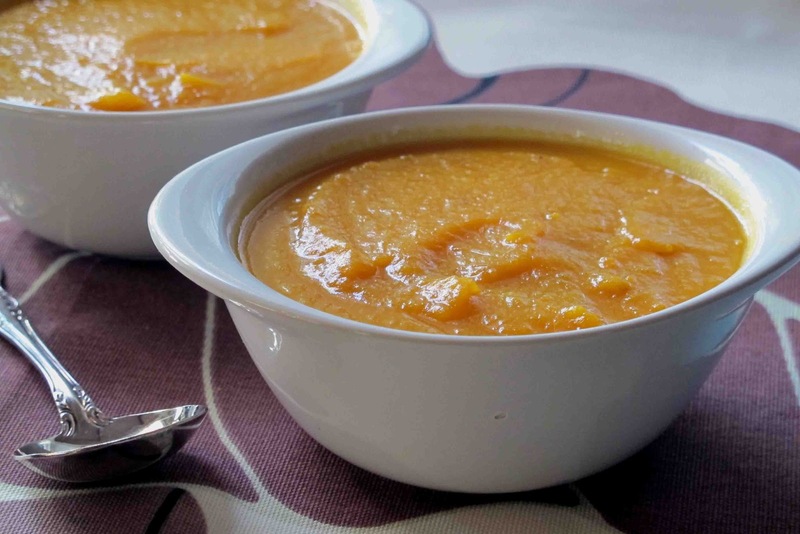 Although it is a thick soup it is low in calories. I recently discovered the little apricot delight orange coloured yams in our supermarket. They are grown in Feilding by Halford's and add a pleasant earthy flavour. If unavailable just leave them out for a slightly thinner soup. Serve with a swirl of cream or yoghurt if you wish, and garnish with chopped coriander leaves. 1 tb of freshly grated ginger. Fry the onion and garlic gently for about 6 minutes until the onion is golden. Add the carrots, kumara, orange rind, ginger and cumin and give it a good stir. Keep frying for about 2 minutes. Add the stock and the bayleaf. Then simmer for about 20 minutes until the carrots and kumara are tender. Pour in the orange juice and season to taste. Reheat the soup to boiling point if you want to serve it piping hot. Serve in bowls garnished with chopped parsley or coriander. I spotted these delicious morsels at a Korean Food Fair on the North Shore recently. 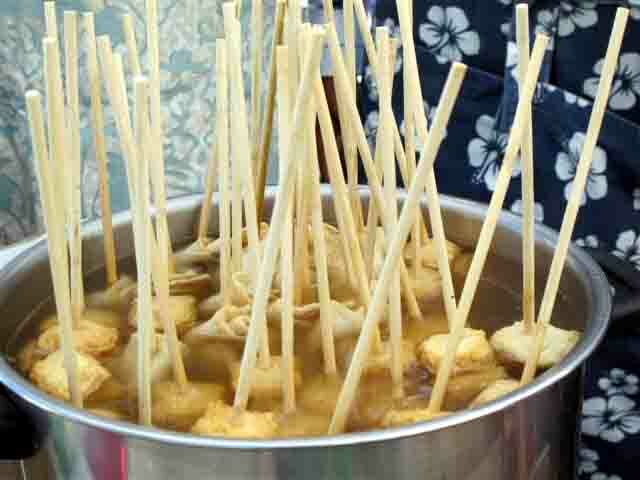 Not dumplings, not satay sticks. Savoury popsicles perhaps? Bought for me at the Motueka Farmers' market by my daughter . Crumbly and with a very distinctive flavour. It made a great lunch. 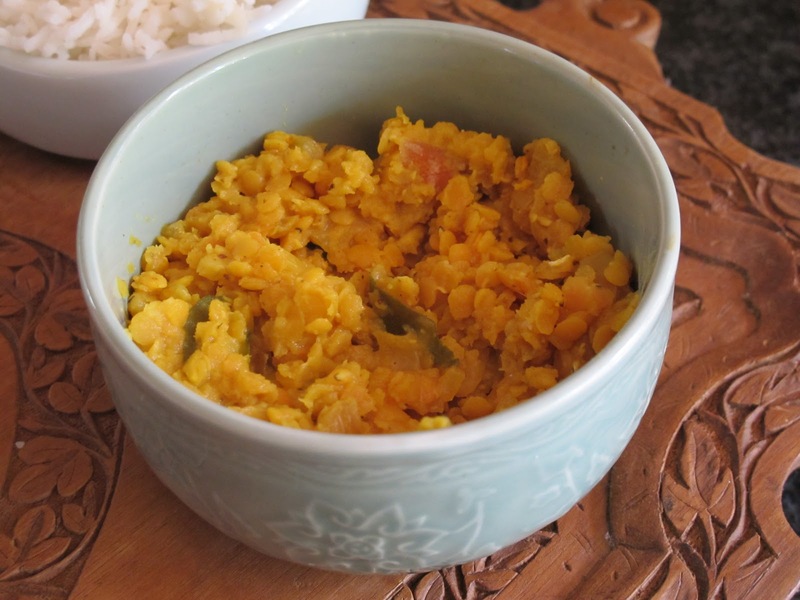 The original recipe , called Khade Masoor ke Dal ( Lentil flavoured with Curry Leaves)had far more Ghee and chillies in it making it a very rich dish which I am sure would be exceptionally delicious but very calorific and too hot for some. Instead of garlic and ginger paste I chopped some garlic and grated some fresh ginger. The curry leaves are an important part of this recipe. Asian food stores often stock them. They taste much better fresh than frozen. 1 large onion (finely chopped. Heat the ghee/oil in a pan. Add the onions, yellow chili, garlic, ginger , red chili powder, and curry leaves. Fry for 3 minutes. Add the lentils and salt. Fry for a further 4 minutes. Affogato made with Kohu Road Vanilla Ice-cream. 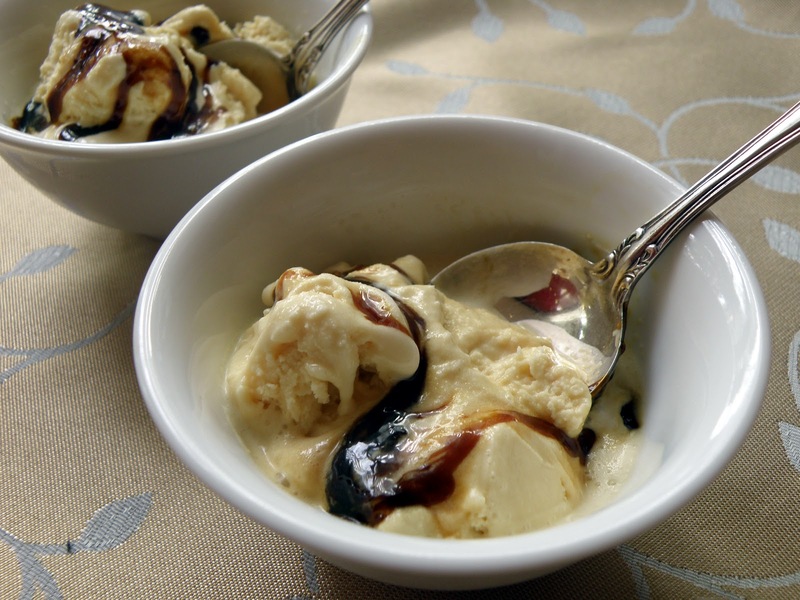 Just brew a cup of espresso coffee and pour over bowls of Kohu Road Vanilla Ice-cream. This ice-cream is totally natural, made with free range eggs, organic milk, organic sugar and A Grade Tongan planifolia vanilla pods. It's seriously good. Eat at once, before it melts. 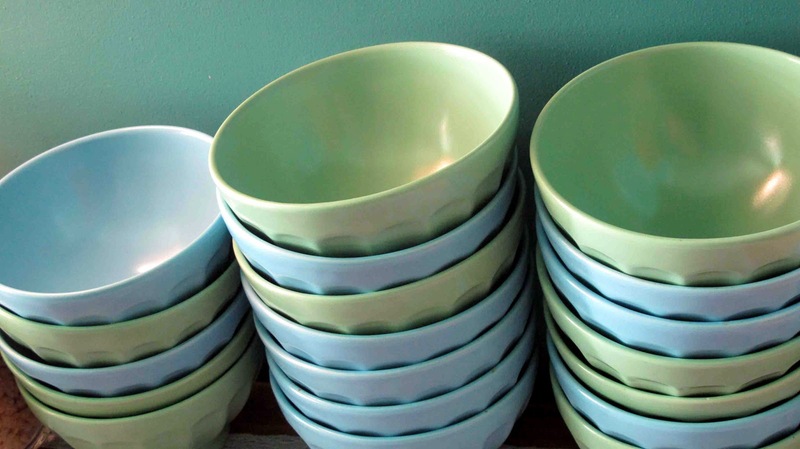 That quiet moment on a weekend morning before the breakfast bowls are filled. Photo taken at the Great Ponsonby Art Hotel. I snapped these chocolate flowers at a Food Show. Too cute to eat. Almond Croissants: Who makes the best ? There's a little French bakery at Northcote Point where the almond croissants are divine. Could these be surpassed? I'm on the lookout. 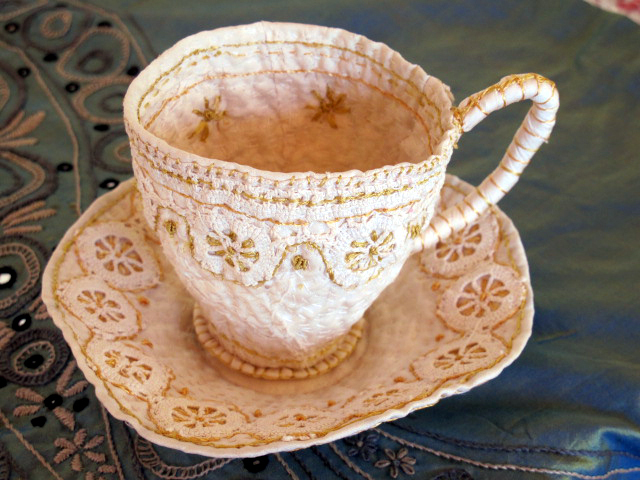 I spotted this little embroidered teacup at the Lakehouse Art Fair this Saturday. At our local Indian supermarket I discovered some cans of mango pulp. 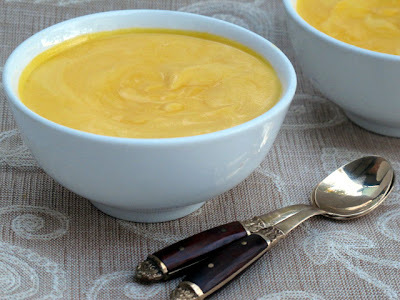 We were having a pot luck Indian dinner with friends that week so I created this Mango Mousse, now one of our very favourite desserts. Sprinkle gelatine over ¼ cup of cold water. Leave for about 1 minute until it thickens. Then heat in microwave for about 30 seconds. Check after 30 seconds. If gelatine has not completely dissolved give it another 10 second burst. Pour the mango pulp into the food processor bowl. Add the limoncello/ vanilla essence / rum. Keep whizzing as you pour the gelatine mixture down the feed tube. Now pour the mixture into a large bowl and stir the yoghurt in. Whip the cream lightly and also stir this in gently. Spoon the mousse into individual dessert glasses or one large dish. Leave to set for several hours. A healthy breakfast gives you a great start for the day. 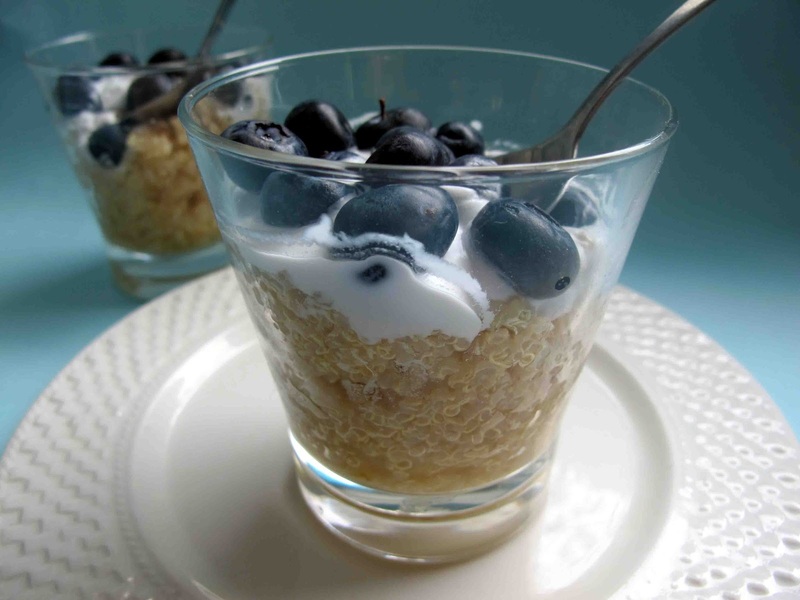 For a special treat try my version of blueberry, coconut and quinoa porridge. It’s not only delicious, it’s health in a bowl. Blueberries: A Superfood which is one of the richest sources of natural antioxidants, more than twice the level of other berries. Coconut Oil: Use virgin coconut oil which has not been chemically treated (other kinds of kinds of coconut oil have been partially hydrogenated which creates those nasty unhealthy transfats.) Virgin coconut oil contains about 50 percent lauric acid, a medium chain fatty acid which is also abundantly found in breast milk. What’s good for babies is good for you! 2. Add it to 2 cups of water and bring to the boil. 4. Let it simmer on a low heat for about 10- minutes. It may need a little longer. Little tails will appear on each grain when they are done. 5. Remove from the heat and stir in 1 tablespoon of coconut oil, 1 tablespoon of honey, the cinnamon and a pinch of salt. 6. Ladle into small bowls . Squeeze a few drops of lemon juice over the top. 7. Then pour over 1-2 tablespoons of coconut cream. 8. Sprinkle blueberries on top. At Easter time I asked the staff at Whittaker’s for their favourite hot chocolate recipe and back came this one from Jasmine Griffin, their brand manager. It is seriously good! 1. 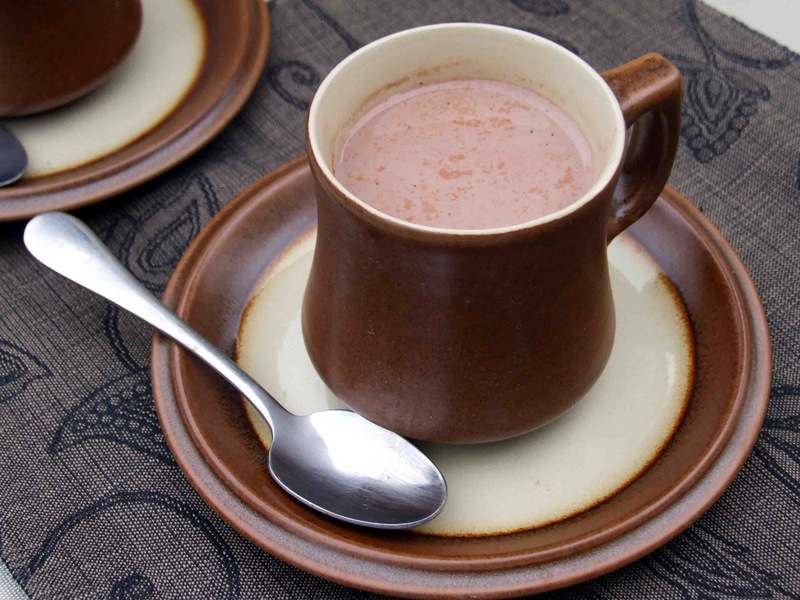 Break up the santé bar and place in a pot with the milk and the cream. 2. Whisk or stir continuously over a medium heat until melted. Pour into a cup and serve immediately. Choose one or more of the following: grated chocolate, a sprinkle of cocoa powder, a dollop of whipped cream or ice-cream, marshmallows. Serve with a cinnamon stick stirrer. Margreet. It comes from Omakau; near the Otago Central Rail Trail.To make it you need a whole pumpkin. You simply make a few cuts into it with a knife to make sure it doesn’t explode, and then cook it for 15 minutes in the microwave which softens it, making it easier to peel and chop. In the meantime fry an onion with garlic and ginger, and then add the chopped pumpkin and all the other ingredients except for the coconut cream. The chili sauce adds a little sweetness and heat, the ginger some zing, red pepper adds to the warm colour, and the orange juice gives it a fresh fruity flavour. Bring it to the boil and then let it simmer for 30 minutes before using a stick blender to make it smooth. It makes an ambrosial soup, enriched by a swirl of coconut cream at the end. If you wish, and I usually do, you can leave it simmering in a slow cooker instead for about 6 hours, which fills the house with the homely smell of good soup and gives the flavours time to mellow. At the bottom of her recipe there was a note: Serve with cheese rolls. Cheese rolls? Never heard of them! It seems unbelievable now but it’s true that on several trips to the South Island I had failed to come across them. No less a source than Wikipedia gives them a mention as one of a very small number of recipes which are specific to only one of New Zealand’s main islands. This culinary icon has been around for a long time. It was first recorded in a National Newspaper called Truth in 1935 which apart from much scurrilous gossip also published some good recipes. Originally they were called rat traps, probably because of their rotund little bodies and to distinguish them from mouse traps. They really took off in the 1950’s when commercially sliced bread came on the market, making it easier to prepare them. Then they hit the headlines last week when the winner of a Mainland Cheese roll competition held as part of the New Zealand International Science Festival was announced in Dunedin. It was a truly scientific quest in which no less than 81 entries were rigorously scrutinized for taste, texture, appearance, nutrition and the all important ooze factor. The Mainland’s winning cheese roll or the Cheese Rolls Royce as the Southland Times aptly called it was made by Joy Jones from Dunedin. She learnt the recipe from her Mum and now makes them for Robbie’s Bar and Grill in South Dunedin. In the traditional mainland style it had a substantial amount of cheesy filling, and was made with onion soup mix and evaporated milk. Professor Phil Bremer described them as flavoursome, thick cohesive and smooth with a full bodied texture that delivered a rich mouth feel. In addition the fact that .the ingredients were heated in the microwave ensured a homogeneous easily spreadable filling that did not separate or go greasy when the cheese roll was heated. Why cheese rolls have failed to cross Cook Strait, head North and become a café staple up here, remains a bit of a mystery. Maybe we’ve been so slow to catch on because we were too busy grazing on ciabatta, pita bread, bagels, naan and croissants to fully appreciate just how special this regional comfort food is. My sister kindly emailed me her family recipe for cheese rolls .Unlike the winning recipe it does not contain cream so a little less dangerous for the waistline! And so convenient, if not eaten straight away you can pop them into the freezer and they can go straight from there under the oven grill. She keeps a constant supply of them. 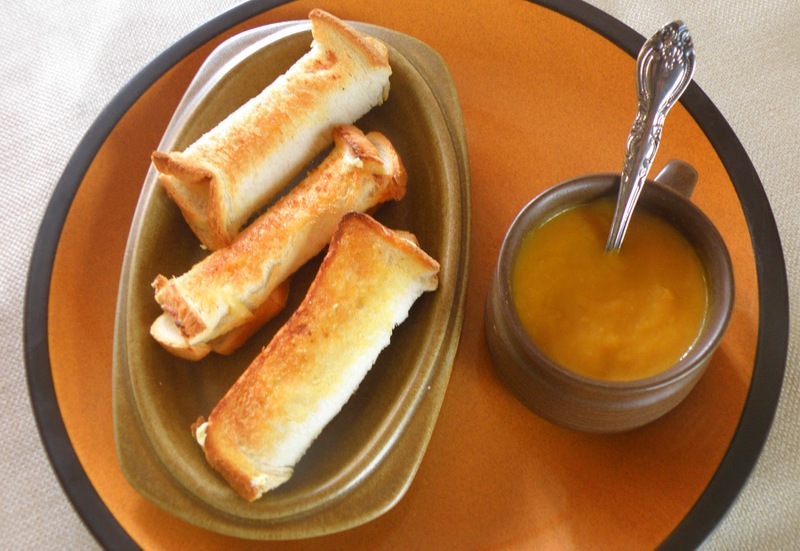 For these cheese rolls simply simmer a cup of milk with a packet of onion soup and stir till it thickens, then melt in lots of Cheddar Cheese (might as well use Mainland!) Use this mixture to spread on pieces of sandwich sliced white bread and roll them into a cylindrical shape. It takes three folds. No need to cut off the crusts. Put under the grill until a golden brown on both sides, then spread generously with butter. Being an Aucklander I was tempted to tamper with the recipe, to add a dash of sherry, a little mustard, a few chopped up sundried tomatoes or olives but in the end I did it her way, and there were no regrets. This was real comfort food, tasty but simple. We dunked them into our pumpkin soup. The one mistake I had made was to spread the cheese filling on too thinly, so it failed to ooze out as it should. It still tasted good but thicker would have been better. Next time we have overseas visitors who want to taste some real kiwiana, I might well serve them cheese rolls with pumpkin soup, followed by roast lamb and a pavlova with canned peaches for afters. The fact that Wikipedia named the cheese roll as one of a number of very small recipes which are specific to the Mainland continues to intrigue me. Having developed a taste for them I am now on a small mission to discover what these other recipes might be. I’ll just have to invest in some more merino woolies, a balaclava and Ugg boots and cross over Cook Straight on the ferry. Then onto on a voyage of discovery to ferret them out. Make a few cuts into the pumpkin (to prevent it from exploding) before putting it in the microwave for 15 minutes. This will make it much easier to peel and cut up. Sauté onion, ginger and garlic until the onion has softened but not browned. Put these in the slow cooker with the chopped up pumpkin and all the other ingredients except the coconut cream and coriander. Bring to boil in a saucepan, cover and simmer for 30 minutes. Pour into bowls and into each swirl a tablespoon of coconut cream. Put onion soup and milk in a saucepan. Heat over a moderate heat until the mixture thickens. Grill on both sides till golden brown and the cheese has melted. A favourite Samoan treat on special occasions is Pineapple pie (Pai Fala). It’s a delicious sweet half moon shaped pastry. One of my Samoan students, Sandra Ivala , gave me a few tips on how to make a Pai Fala. At her home, as in lots of Samoan families, there is a special extended family gathering after church every Sunday where traditional Samoan foods are enjoyed. “First make the filling and let it cool before rolling out the pastry on a floured surface. Lift the pastry onto a plate and then trim the edges so you have a round shape. Then spoon the pineapple filling on one half of it before flipping the pastry over to make a half moon shape. It looks nice to decorate the pastry by using the prong of a fork to make a pattern along the edge. It’s also important to pierce the top of the pastry several times with a fork so steam can escape. All the traditional recipes for Pai Fala which I looked at on the net are very rich in fat and sugar. 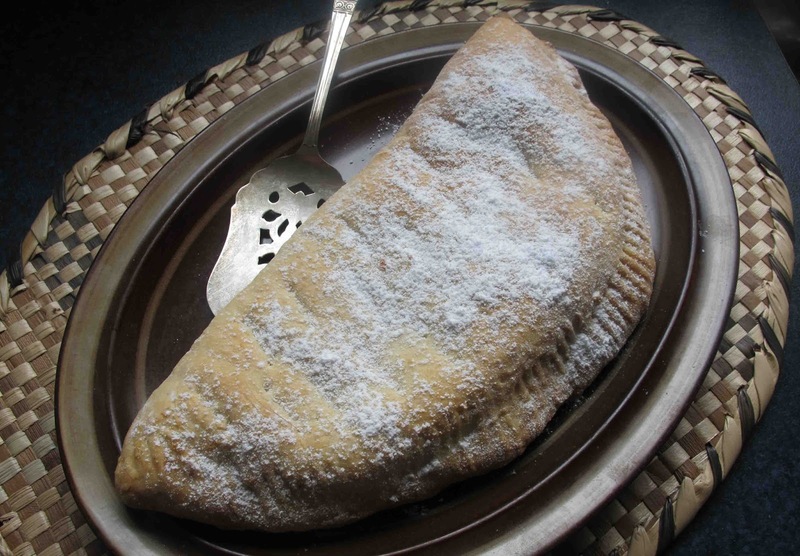 As healthy eating is a focus of Samoan Language week this year I decided to give the Pai Fala a healthy make-over by reducing the sugar in the filling and using coconut milk instead of coconut cream in the pastry. I have also made the recipe smaller. It still makes a sizeable dessert, but for an extended family gathering it can be easily doubled or tripled. This recipe will make 2 large pastries. Pour the crushed pineapple into a sieve that is placed over a bowl. Gently press onto it with the back of a spoon to extract the juice. Mix the custard powder and the sugar into the juice. Microwave 1 minute in a microwave safe bowl/jug. Then stir. Microwave 1 further minute. It should have thickened. If not, microwave for a few more seconds. Rub the butter into the flour with your fingertips. Roll each out on a floured surface, lift over a dinner plate and trim the surface. Spoon pineapple filling onto half of it, and flip over. Carefully pinch the two edges together and then make a pattern with the prongs of a fork. Prick a few holes into the top. Lift the Pai Fala onto an oven tray and bake 15-20 minutes at 170 degrees C until golden brown. Sieve icing sugar over the top, or sprinkle with a mixture of brown sugar and icing sugar. Let it cool a little before serving. The Pai Fala can then be cut into slices/quarters. A small scoop of coconut ice cream and/or a fresh tropical fruit salad would be delicious alongside! Lucky us! Our neighbours Gill and David are collecting bucketfuls of feijoas at present and they keep giving us bags of them. Apart from cutting them in halves and scooping them out with a spoon they make great cakes and Fijoa and apple crumbles. 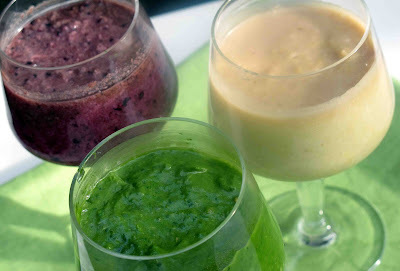 This year I decided to try something new and spent a few hours in the kitchen creating feijoa smoothies. ¾ cup (1 small punnet) of blueberries. For this smoothie first blend the water and spinach together in bursts until the spinach is reduced to small flecks. Add the feijoas, avocado and coriander and blend again. Add crushed ice and blend again briefly. 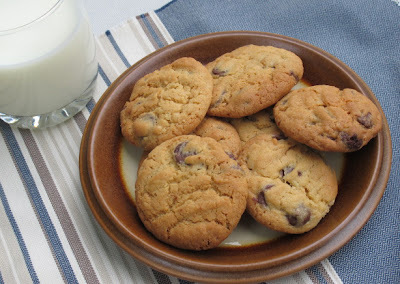 Chocolate Chip Biscuits for Becky who wants to learn how to bake. Perfect for snacking with a glass of milk after school. My favourite bread recipe is one that has been perfected by one of my sisters for over 25 years. A Bread maker takes all the hard work out of baking a loaf. Once the ingredients are in it’s on the way with the push of a button. It’s also an energy efficient way of baking as it uses less power than an oven. But I don’t have one, and as bread is not something I make every day, I prefer to make it by hand. I like the rhythmic kneading; the feel of the dough as it changes from sticky to silky, punching it down again after the rising, and shaping it by hand. The recipe suggests kneading for five minutes, but I give it ten. 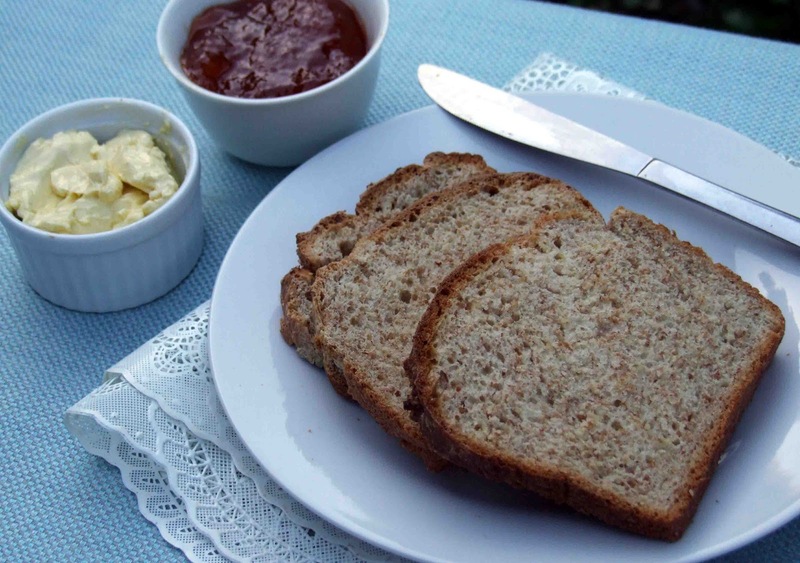 The kneading develops the gluten in the dough and it’s this gluten, or wheat protein, which makes the bread rise. So a well kneaded loaf will be lighter. You don’t want a brick! Instead of putting the tins in hot water in the sink I sometimes put the dough in the fridge and let it rise slowly for most of the day. Or if I start it off in the evening it can stay in overnight. The cold temperature will not kill off the yeast and it improves the flavour. The one ingredient for this bread that I was unfamiliar to me was Maltexo. Maltexo originated in Dunedin at the turn of the Century so has been around for a while. Essentially it’s a malt extract made from New Zealand Barley. It is turned into a concentrated syrup through controlled germination and brewing processes. For decades kiwi Mums used to feed their kids a regular spoonful of Maltexo as well as using it in their baking. (I prepare up to twelve bags of this mix at a time and keep them in a cupboard. Using them means you need to allow only a few minutes to set up the bread maker. You don’t, of course, need to use a bread maker. I used this recipe for 20 years before I had a bread maker. If you choose to make it by hand, put all the ingredients (including those listed under the directions) in a bowl and mix by hand, kneading the dough for five minutes at least( great fun to do with grandchildren!) – leave to rise in a greased bowl until double and proceed as from step 5. 4. Set bread maker to whole-wheat bread/ dough (At this stage you can choose to complete the entire process in the bread maker – in which case you should choose the whole wheat bread/ bake option). 6. Place bread tins in sink of hot water (water to come up to about ¾ of tins) and cover tins with a cloth. 7. When risen to at least double in size, place in preheated 2200C oven for 10 minutes, then reduce heat to 1800C for another 16 minutes. 8. Turn out on to rack and leave to cool. This bread also freezes really well, especially if you wrap it and put it in the freezer while still slightly warm. Summer is on the way at last and the days are getting longer. In the early evening, if friends drop by it will soon be warm enough to be out on the deck leisurely sipping a glass of wine and enjoying some pre dinner snacks. Two of my favourites snacks are made with pesto, a classical Italian sauce. Freshly made pesto is more fragrant and tastes so much better than that out of a jar from the supermarket. Traditionally it was made by grinding the herbs with garlic, nuts and coarse salt with a pestle against the sides of a mortar, a laborious task. Purists may still want to do it that way but in the food processor it only takes a few seconds to reduce all the ingredients into a smooth and silky sauce. The secret of making a good pesto is to use a good olive oil and nuts which are fresh so it’s best to avoid those from the bulk bins. Stale or rancid nuts will spoil it. Lightly toasting the nuts improves the flavour. The green herbs, the olive oil and the nuts in pesto all add up to a healthy food. Macadamias are rich in monounsaturated fats, Brazils in selenium, almonds have healthy unsaturated fats and walnuts are the omega-3 nut. Pesto Genovese (the original pesto) is made with basil and pine nuts but there are lots of other possible combinations. Green herbs such as mint, parsley, coriander and rocket can be used and baby spinach. Different nuts also give different flavours. I made several batches of pesto this weekend. We did a tasting of 3 kinds of basil pesto made with Brazil nuts, macadamia nuts and almonds. The Brazil nut pesto was the favourite with a good texture and flavour. The macadamia pesto also appealed, it was smoother but a little oilier. The almond pesto would have been better if I had skinned the nuts first. The texture was a little rough. I also made a walnut pesto with rocket instead of basil which resulted in a peppery flavour. A squeeze of lemon juice enhanced it. Any leftover pesto won‘t go to waste. It keeps well in the fridge for a week or so with a splash of olive oil over the top to keep it from drying out. Store it in a tightly sealed container. If you want to keep it longer you can freeze pesto in an ice cube tray. One snack I often make is based on a recipe from BBC Good Food by Rick Stein. He cuts puff pastry into little squares and spreads each with pesto. First a half cherry tomato goes on top followed by a little more pesto ,a fine asparagus spear, a sprinkle of grated parmesan and a dribble of olive oil. Then he seasons them well with rock salt and pepper and bakes them in a hot oven slightly spread apart so they have room to puff up) for about 5-8 minutes until the pastry is golden and the cheese has melted. Instead of asparagus I use whatever there is in the fridge at the time such as thinly sliced mushrooms or sliced yellow pepper or a sliver of bacon or may garnish each square with finely chopped basil once baked. Here is the basic recipe I used and its nutty variations. It makes a moist pesto which is how I like it. Decrease the amount of oil if you want a firmer mixture. Do experiment further by substituting different herbs or nuts. ¼ cup of a good olive oil. Rock salt and black pepper to taste. Put the garlic, nuts and basil in the food processor and process briefly until these are finely chopped. Then start to gradually pour in the olive oil. You can add more or less depending on the consistency you want. Scrape the mixture into a bowl, stir in the freshly grated parmesan, and season to taste.